Central Coast, Dec. 3, 2015 – Peoples’ Self-Help Housing (PSHH) announces the election of its newest member of its Board of Directors, Shelly Higginbotham. 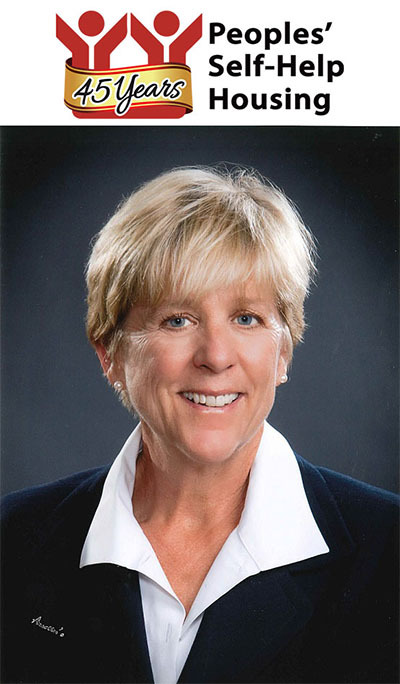 Higginbotham is currently serving her third term as Mayor of the City of Pismo Beach, is President of the Five Cities Homeless Coalition and has also served on the Women’s Legacy Fund grant committee of the San Luis Obispo County Community Foundation. She was named board member emeritus for the Child Development Resource Center. She is past president of the Channel Counties Division of the League of California Cities and was named New Times Best Elected Official in 2013. She holds a B.S. degree in child development and a Master’s degree in psychology from Cal Poly University, San Luis Obispo. Founded in 1970, PSHH is an award winning non-profit organization that develops affordable housing and community facilities for low-income households and homeownership opportunities for working families and special needs populations, such as seniors, veterans, the disabled, and the formerly homeless. With nearly 1,200 self-help homes completed and over 1,600 rental units developed, PSHH is the largest affordable housing developer on the Central Coast, with offices in San Luis Obispo and Santa Barbara. For more information on Peoples’ Self-Help Housing, visit www.pshhc.org.